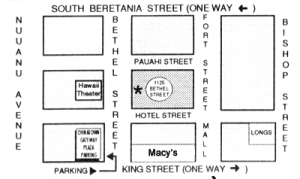 We are located in the downtown Honolulu area directly across from the historic Hawaii Theatre entrance on the ground level. Validated parking is available at the CHINATOWN GATEWAY PLAZA (parking entrance directly across from the WAL-MART parking entrance on Bethel Street). On Saturdays, you are welcome to park at the WAL-MART parking garage, which is FREE to the public on Saturdays. On Thursday evenings, we sometimes close early due to continuing education, meeting, or other commitments. Thank you for your understanding!